The Dockem Card Sleeve for the Google Pixel and Google Pixel 2 smartphone is a highly functional yet attractive wallet style sleeve. The premium vintage synthetic leather gives a sophisticated feel that provides a versatile look; it fits in with your casual jeans but also doesn't look out of place in a professional environment. 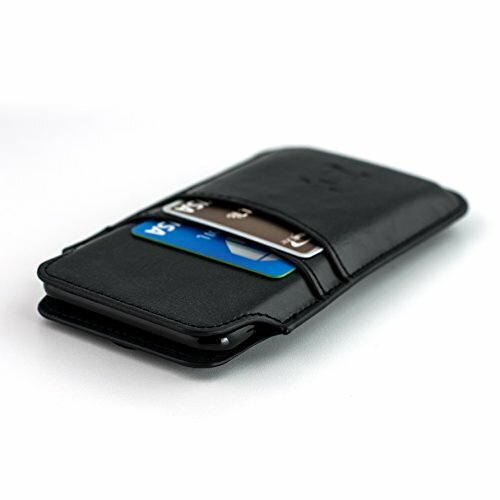 2 card slots make this case an incredibly functional item to add to any smartphone user's repertoire. Go Wallet-less: Free yourself from one more item in your pockets. In today's world with everything electronic and on your smartphone already, it's not as necessary to carry a whole wallet. Keep your driver's license or other ID and your favorite credit card right with your phone, and you're set for most situations! Easy in and out: This sleeve has an integrated pull tab, which eliminates any struggle in getting your phone out of the case. Just pull the tab, and your phone will eject about 2.5 cm out of the sleeve, allowing you to easily grasp and slide the phone out the rest of the way. The pull tab retracts automatically and attaches discreetly to the back of the sleeve with small hidden integrated magnets. Compatibility: Designed only for use with a naked Google Pixel or Google Pixel 2 Phone (meaning no other shells or cases on your phone). Backed by Dockem's USA Based Customer Support and Quality Guarantee: Customer satisfaction means the world to us. As with all of our products, we offer quick, professional, and hassle-free support. Should anything go wrong, we're here to help and to resolve it in the most convenient manner possible.